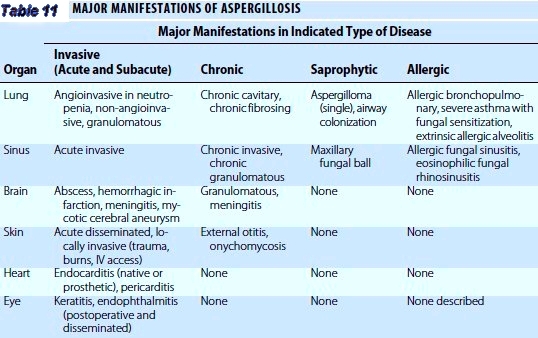 Aspergillosis is the collective term used to describe all disease entities caused by any one of ~35 pathogenic and allergenic species of Aspergillus. Only those species that grow at 37°C can cause invasive infection, although some species without this capability can cause allergic syndromes. A. fumigatus is responsible for most cases of invasive aspergillosis, almost all cases of chronic aspergillosis, and most allergic syndromes. A. flavus is more prevalent in some hospitals and causes a higher proportion of cases of sinus and cutaneous infection and keratitis than A. fumigatus. A. niger can cause invasive infection but more commonly colonizes the respiratory tract and causes external otitis. A. terreus causes only invasive disease, usually with a poor prognosis. A. nidulans occasionally causes invasive infection, primarily in patients with chronic granulomatous disease. The primary risk factors for invasive aspergillosis are profound neutropenia and glucocorticoid use; risk increases with longer duration of these conditions. Higher doses of glucocorticoids increase the risk of both acquisition of invasive aspergillosis and death from the infection. Neutrophil and/or phagocyte dysfunction is also an important risk factor, as evidenced by aspergillosis in chronic granulomatous disease, advanced HIV infection, and relapsed leukemia. An increasing incidence of invasive aspergillosis in medical intensive care units suggests that, in patients who are not immunocompromised, temporary abrogation of protective responses as a result of glucocorticoid use or a general anti-inflammatory state is a significant risk factor. Many patients have some evidence of prior pulmonary disease-typically, a history of pneumonia or chronic obstructive pulmonary disease. Glucocorticoid use does not appear to predispose to invasive Aspergillus sinusitis but probably increases the risk of dissemination after pulmonary infection. Patients with chronic pulmonary aspergillosis have a wide spectrum of underlying pulmonary disease, often tuberculosis or sarcoidosis. Patients are immunocompetent except that a genetic defect in mannose-binding protein is common, as are some cytokine regulation defects, most of which are consistent with an inability to mount an inflammatory immune (TH1-like) response. Glucocorticoids accelerate disease progression. Allergic bronchopulmonary aspergillosis (ABPA) is associated with certain HLA class II types; polymorphisms of interleukin (IL) 4Ra, IL- 10, and SPA2 genes; and heterozygosity of the cystic fibrosis transmembrane conductance regulator (CFTR) gene. These associations suggest a strong genetic basis for the development of a TH2-like and “allergic” response to A. fumigatus; this response probably is also protective against invasive disease, since high-dose glucocorticoid treatment for exacerbations of ABPA almost never leads to invasive aspergillosis. • Aspergillus species are ubiquitous in the environment internationally and occur as a mold found in soil. • Cause a variety of illness from hypersensitivity pneumonitis to disseminated overwhelming infection in immunosuppressed patients. • Frequently cultured from samples obtained in hospital wards from unfiltered outside air circulating through open windows. • Reaches the patient by airborne conidia (spores) that are small enough (2.5 to 3 mm) to reach the alveoli on inhalation. • Can also invade the nose and paranasal sinuses, external ear, or traumatized skin. • The clinical syndrome and pathologic spectrum of Aspergillus lung disease is dependent on the underlying lung architecture, the host’s immune response, and the degree of inoculum. • Aspergillus fumigatus is the usual cause. • A. flavus is the second most important species, particularly in invasive disease of immunosuppressed patients and in lesions beginning in the nose and paranasal sinuses. • Represents a hypersensitivity pneumonitis. • Presents as cough, dyspnea, fever, chills, and malaise typically 4 to 8 hr after exposure. • Repeated attacks can lead to granulomatous disease and pulmonary fibrosis. • Symptoms occur most commonly in atopic individuals during the third and fourth decades of life. • Hypersensitivity reaction of the airways to Aspergillus fungal antigens present in the bronchial tree. • Results from an initial type I (immediate hypersensitivity) and a type III reaction (immune complexes), which is most likely responsible for the roentgenographic features and more destructive changes of the bronchi. • Underdiagnosed pulmonary disorder in patients with asthma and cystic fibrosis. • In the absence of invasion or significant immune response, Aspergillus can colonize a preexisting cavity, causing pulmonary aspergilloma. • Forms masses of tangled hyphal elements, fibrin, and mucus. • Patients typically have a history of chronic lung disease, tuberculosis, sarcoidosis, or emphysema. FIGURE 11-3 Invasive aspergillosis: conditions placing patients at elevated risk of acquisition and relatively rapid progression. 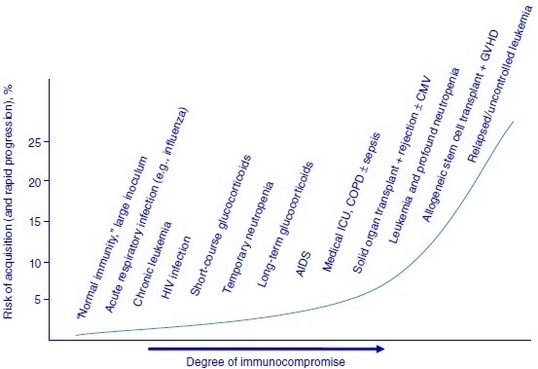 ICU, intensive care unit; COPD, chronic obstructive pulmonary disease; CMV, cytomegalovirus; GVHD, graft-vs-host disease. • Patients with prolonged and profound granulocytopenia are predisposed to rapidly progressive Aspergillus pneumonia. • Lungs typically manifest a necrotizing bronchopneumonia, ranging from small areas of infiltrate to intensive bilateral hemorrhagic infarction. • Most common presentation is that of unremitting fever and a new pulmonary infiltrate despite broad-spectrum antibiotic therapy in an immunosuppressed patient. • Dyspnea and nonproductive cough are common; sudden pleuritic pain and tachycardia, sometimes with a pleural rub, may mimic pulmonary embolism; hemoptysis is uncommon. • Roentgenograms may reveal patchy bronchopneumonic, nodular densities, consolidation, or cavitation. • Immunocompromised patients: invasive pulmonary Aspergillus (IPA) generally is acute and evolves over days to weeks; less commonly, patients with normal or only mild abnormalities of their immune systems may develop a more chronic, slowly progressive form of IPA. • Cerebral infarction from hematogenous dissemination may occur in immunosuppressed individuals. • Abscess formation may occur from direct extension of invasive disease in the sinuses. 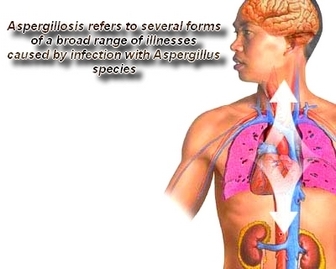 • Esophageal or gastrointestinal ulcerations caused by Aspergillus may occur in the immunosuppressed host. • Fatal perforation of the viscus or bowel infarction may occur. • Necrotizing skin ulcers involving the extremities. Patients with AIDS and a CD4 count of below 50 mm3 have increased susceptibility to invasive aspergillosis. INVASIVE ASPERGILLOSIS: Definitive diagnosis requires the demonstration of tissue invasion as seen on a biopsy specimen (i.e., septate, acute branching hyphae) or a positive culture from the tissue obtained by an invasive procedure such as transbronchial biopsy. 1. Sputum and nasal cultures: in high-risk patients a positive culture is strongly suggestive of invasive aspergillosis. • Chest roentgenograms show a variety of abnormalities from small, patchy, fleeting infiltrates (commonly in the upper lobes) to lobar consolidation and/or cavitation. • A majority of patients eventually develop central bronchiectasis. ASPERGILLOMAS: Chest roentgeno-grams or CT scans usually show the characteristic intracavity mass partially surrounded by a crescent of air. INVASIVE ASPERGILLOSIS: Chest roentgenograms and CT scanning may reveal cavity formation. • Prednisone (0.5 to 1 mg/kg PO) until the chest roentgenogram has cleared, followed by alternate-day therapy at 0.5 mg/kg PO (3 to 6 mo). • If a patient is corticosteroid dependent, prophylaxis for the prevention of Pneumocystis carinii infection and maintenance of bone mineralization should be considered. • Serial chest roentgenograms and serum IgE useful in guiding treatment. • Itraconazole 200 mg po bid for 4 to 6 mo, then taper over 4 to 6 mo; may be considered as a corticosteroid spanning agent or if corticosteroids are ineffective. • Up to 10% of aspergillomas may resolve clinically without overt pharmacologic or surgical intervention. • Observation for asymptomatic patients. • Surgical resection/arterial embolization for those patients with severe hemoptysis or life-threatening hemorrhage. • For those patients at risk for marked hemoptysis with inadequate pulmonary reserve, consider itraconazole 200 to 400 mg/day PO. • Amphotericin B 0.8 to 1.2 mg/kg IV qd to a total dose of 2 to 2.5 g; itraconazole 200 to 400 mg/d PO for 1 yr.
• Amphotericin B lipid complex (ABLC) 5 mg/kg IV qd in those intolerant of or refractory to amphotericin B. • Amphotericin B colloidal dispersion (ABCD) 3 to 6 mg/kg IV qd; stepwise approach in those who have failed amphotericin B. • Liposomal amphotericin B (L-AMB) 3 to 5 mg/kg IV q day; stepwise approach is indicated as empiric therapy for presumed fungal infection in febrile neutropenic patients who are refractory to or intolerant of amphotericin B. • Itraconazole 200 mg IV bid x 4 doses followed by 200 mg IV qd or 200 mg tid for 4 days, then 200 mg bid PO-first-line therapy if not taking p450 inducers. • Voriconazole 6 mg/kg IV bid followed by 6 mg/kg IV for up to 27 days, then 400 mg/day PO for up to 24 wk. Note that the optimal dose regimens have yet to be defined. • Casofungins (Candigas) is the first of a new class of antifungals, the echinocandins approved by the FDA for the treatment of invasive aspergillosis in patients who fail to respond to or are unable to tolerate other antifungal drugs. The recommended dosage is 70 mg on the first day and 50 mg daily thereafter, given as a single. Note: The oral dose is usually 200 mg bid for voriconazole and itraconazole and 400 mg bid for posaconazole. The IV dose of voriconazole is 6 mg/kg twice at 12-h intervals (loading doses) followed by 4 mg/kg q12h. Plasma monitoring is helpful in optimizing the dosage. Caspofungin is given as a single loading dose of 70 mg, followed by 50 mg/d; some authorities use 70 mg/d for patients weighing >80 kg, and lower doses are required with hepatic dysfunction. Micafungin is given as 50 mg/d for prophylaxis and as at least 150 mg/d for treatment; this drug is not yet approved by the U.S. Food and Drug Administration (FDA) for this indication. Amphotericin B deoxycholate is given at a daily dose of 1 mg/kg if tolerated. Several strategies are available for minimizing renal dysfunction. Lipid-associated amphotericin B is given at 3 mg/kg (AmBisome) or 5 mg/kg (Abelcet). Different regimens are available for aerosolized amphotericin B, but none is FDA approved. Other considerations that may alter dose selection or route include age; concomitant medications; renal, hepatic, or intestinal dysfunction; and drug tolerability.